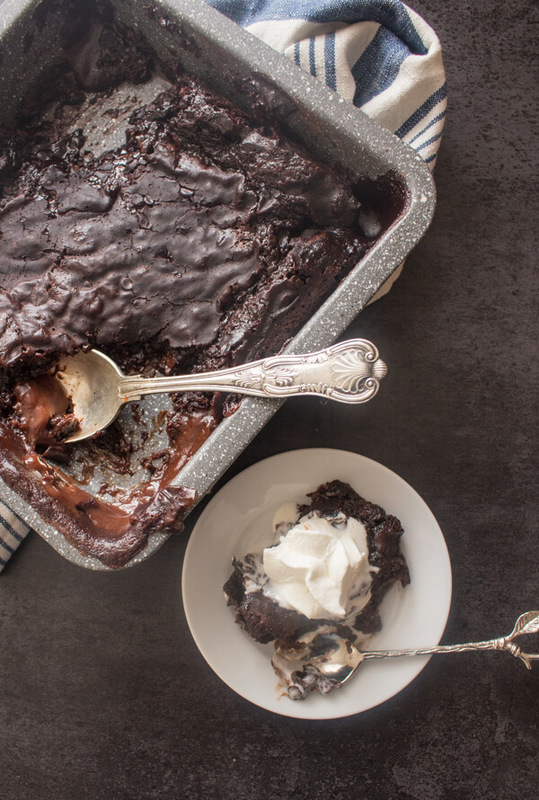 Nothing better than a One Pan Chocolate Pudding Cake, fast, easy and sooo chocolatey. The perfect anytime dessert recipe. This Chocolate Cake can be served as is or why not add a scoop of ice cream?! After we went back and forth with what we like, compared to what her father likes, which unfortunately are always two different things. We love chocolate him not so much. Speaking of chocolate, my daughter has always been intrigued with Lava Cakes and so have I for that matter. Should we make it Chocolate or Fruit or go for something completely different? And then I remembered my Mom’s One Pan Chocolate Pudding Cake. Looking at the recipe I realized that it is very much like a Lava Cake? Just easier and faster. 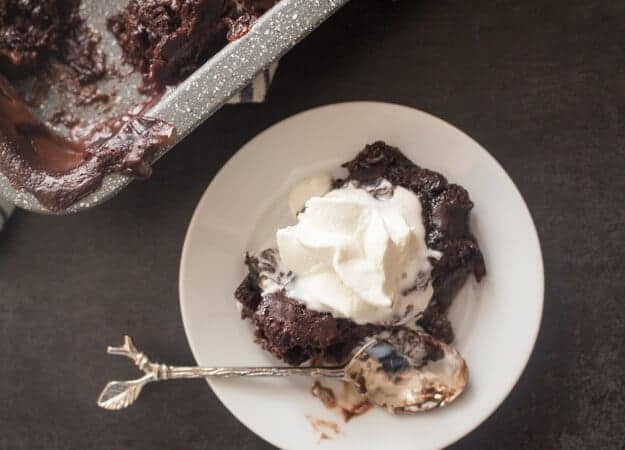 And what’s better than using just one pan for a dessert? 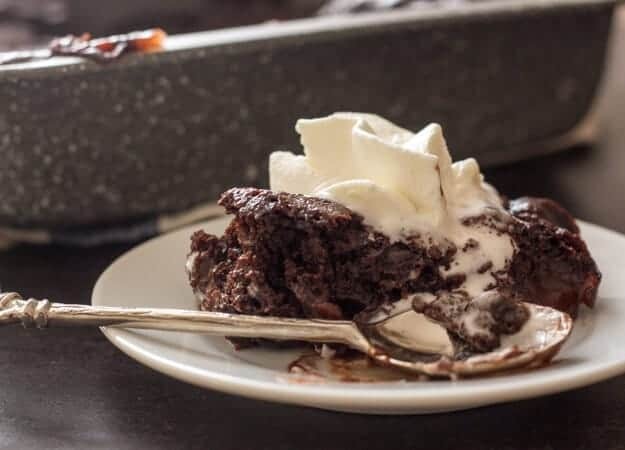 This Chocolate Pudding Cake is baked just until the sides start to pull away from the pan and the top starts to crack slightly. 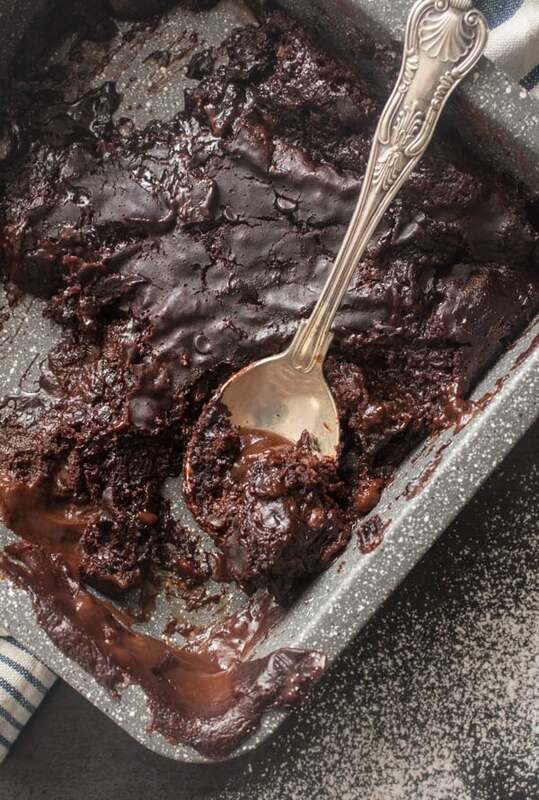 So we got the ingredients together, baked it up and what is the best thing about this Dessert besides being a delicious, chocolatey, decadent wonderful dessert? You get to eat it warm. And what’s even better is when you top this Pudding Cake with some thick creamy whipped cream or even a big scoop of Vanilla Ice Cream. My daughter loved it and so did I.
Desserts like this bring back good memories of when I was a kid and sometimes a vintage recipe is all you need. Especially if it’s chocolate. Her father is still waiting for his fruit dessert. Enjoy! 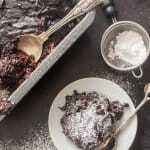 One Pan Chocolate Pudding Cake, a fast and easy Chocolate Dessert Recipe. So yummy, eat warm with a little ice cream. 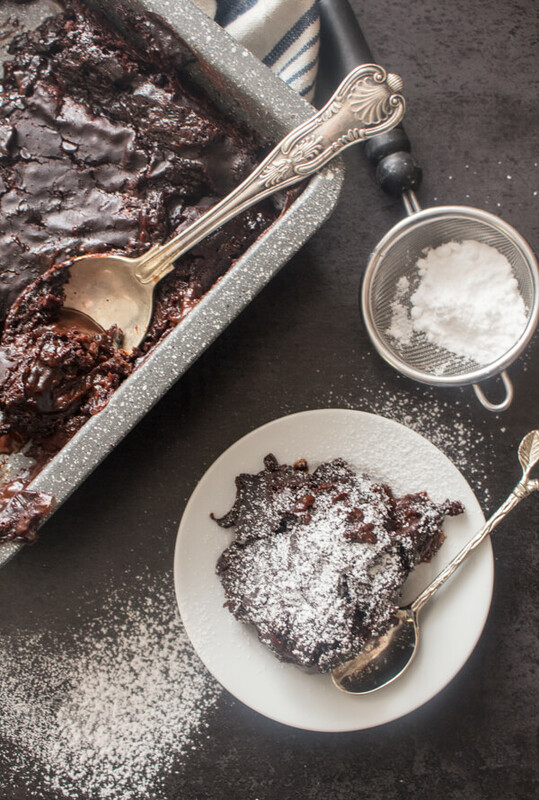 In a 8x8 inch square cake pan, stir together flour, white sugar, 1/4 cup cocoa, baking powder and salt. Add milk and oil and mix well. Sprinkle on top first brown sugar, then cocoa (remaining 1/4 cup), then chocolate chips. 2. Stir the mixture and then pour the hot water over. Do not stir the hot water into the mixture, it must sit on top. Bake for approximately 30 minutes, just until the sides start to pull away from the pan and the top starts to crack slightly, the middle will be a little jiggly. Enjoy! Is the Cocoa powder in this sweetened or unsweetened? And boiling water, or not quite? Sorry, baking is not my strength but this looks yummy so I would like to try it. Hi the cocoa powder is unsweetened and the water is not boiling but very hot. Hope that helps and ask any questions you need to. Have a great Sunday. I’ve been thinking what to make for Valentine’s Day. Well, this pudding cake will definitely be a hit. Thank’s for another great recipe. Hi Ann, thanks I hope you enjoy it. Have a great Sunday. Your cake looks positively decadent! I’m not a huge dessert maker (although I do like to eat them! ), but this looks easy enough for me!